In the previous article we have shared free promotional calendars for the USA and Canada. 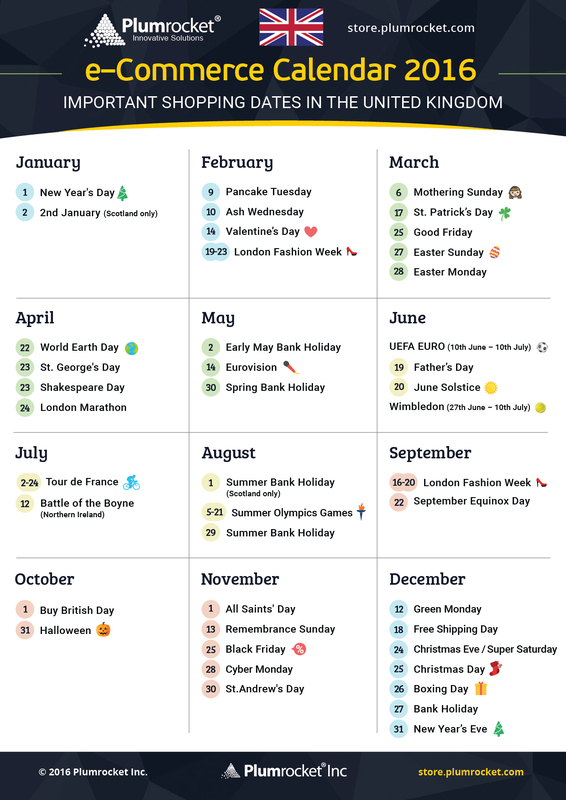 In Part two of this series of articles dedicated to Europe we will provide email marketing calendars for the following countries: United Kingdom, Spain, Germany, France, Ireland, Italy, Ukraine, Poland and Russia. We truly believe that every marketing specialist will benefit from the use of ecommerce calendar from Plumrocket in order to better prepare for the upcoming sales ahead of time. In this series of articles we have compiled the catalog of marketing calendars for North America, Europe, Nordic Countries, Asia-Pacific and Latin America. 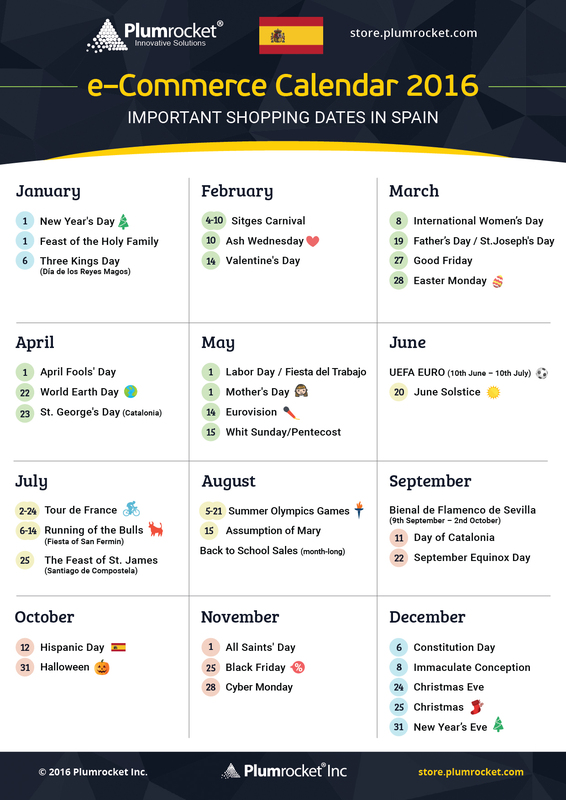 Continue reading to find out more about popular holidays, events and shopping dates in Europe. When preparing for the important shopping dates, make sure that you have your expense budget well thought out, your marketing strategy is ready and you have enough inventory in stock to keep shelves looking full and fresh. Secondly, it’s important to remember that shoppers start looking for gift ideas long before the actual holiday. Let’s take “Mother’s Day” for example. According to our promotional calendars, the holiday is on June 19. But if you use Google Trends tool, you will see that people start looking for Mother’s Day Gifts – one or two months in advance (In March-May). 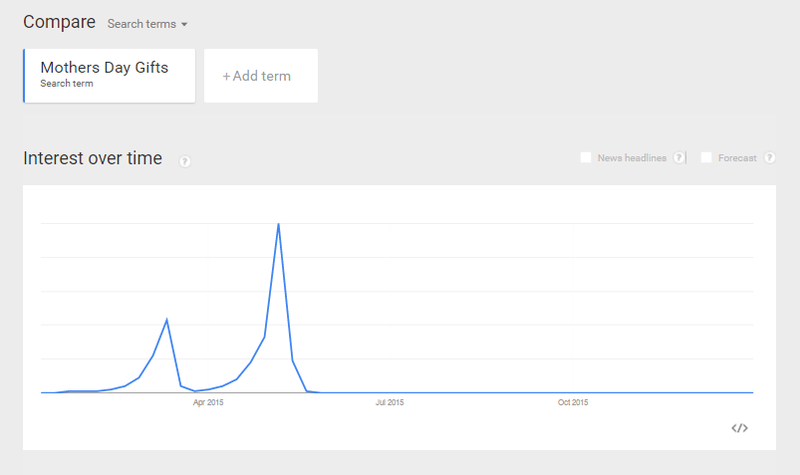 The two search spikes you see in the Google Trends graph below are when the gift searches reach their highest point. The first spike is around March 6th (Mothering Sunday Holiday in the UK) and March 8th (International Women’s Day). The second highest point in this graph is on or around May 8th, when the actual Mother’s Day is celebrated. By analyzing Google Trends data ahead of the holidays you can prepare yourself and your business for upcoming sales and promotions. Start with email marketing campaign in April, at least one month before the holiday. Create a new product category like “Best gifts for Mom in 2016” or create a blog article “Top 10 Mother’s Day Gift Ideas”. Another interesting data provided by Google Trends is “Regional Interest”. In our example, the term “Mothers Day Gifts” is the most popular In the UK, then the second country by interest is USA and Australia is the third. This information will definitely help international businesses to better plan their retail and online promotions. It is clearly shown that not every country celebrates each global holiday in the same way. Right click on the email marketing calendar image below to save it as “JPG” file or scroll down to download printer-friendly version in “PDF” format. We did our best to include all the important dates into the calendars. Please don’t hesitate to drop us a comment if you wish to add another shopping date to your country’s calendar. Please share if you liked this post! How Magento Newsletter Popup Can Grow Your Email Subscriber List?